As with all aspects of the drainage industry High Pressure Water Jetting works raise numerous safety issues prior to any works commencing. There are the obvious risks connected with working in confined spaces, open manholes should be isolated with barrier systems, jetting hoses, water feed hoses and spilled liquids are potential slip and trip hazards. The fine mist that emanates from a chamber during jetting operations carries all kinds of airborne nasties whilst projectiles such as heavy silt, stones, glass and even needles can be ejected from a system at high speed. Working with a High Pressure Water Jetting Unit is a dangerous business in itself, there are large noisy engines and pumps to distract the operator and a jet of high pressure water will easily break the skin often carrying fibres from gloves or clothing into the blood stream. These works should only be undertaken by trained personnel using the correct equipment and safety clothing. Then we have the joys of working with high pressure water in and around a blocked drainage system, this offers the risk of flooding and raw sewage running down the clients driveway or into public areas and worse of all the operator getting a face full of the good stuff when he pulls the jetting hose back just that bit to far. Water is stored in holding tanks before being pumped through a high pressure hose with a jetting nozzle attached at the end, the nozzle has pin holes drilled at angles to the rear, when water is pumped through the nozzle the water jets propel the hose forwards. 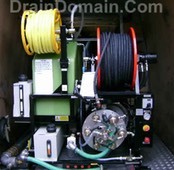 Domestic drainage contractors typically have trailer jetting units or van mounted units (see image to the right), these units usually operate from 1000 to 4000 psi and pump out around 12 to 18 gallons per minute. Large volume jetting units work on similar pressures to the domestic units but use greater volumes of water. They have larger water storage tanks and can therefore work for longer without having to fill up again, there are many varieties of units including vactor units which can pump waste from systems as well as jet them and even large volume units that recycle the very waste water they are working in for jetting purposes. There are small trolley mounted units that can be pushed around that are often used by maintenance staff on large industrial sites and many of the power washers on sale have a small length of hose and a nozzle supplied so that the hapless homeowner can get it stuck down the drain along with his drain rods and plunger. Jetting units are also available on tracked and dumper type vehicles for access to railway sidings and fields etc.. so there is basically a unit for any scenario. Once you have your machinery in place the main concern is having a steady water source to keep up with the jetting unit, as mentioned recycling units are available and contractors on motorway maintenance works will often use large petrol tanker sized trucks to ferry water to the jetting unit. Unlike drain rods jetting hoses will negotiate several bends and junctions and can even be passed around gully traps, most jetting units will carry up to a hundred metres of jetting hose in order to reach blockages that drain rods will get nowhere near. Drain rods will punch a hole through blockages due to tree roots or a build up of grease and fat where as a jetting unit will break up the blockage and cut back the roots to some degree, there are also specialist jetting heads for pipe descaling and for the removal of silt and debris from systems. In an ideal world you would find yourself jetting towards a blockage from a downstream position but it is not always possible, so you tend to find yourself paddling in the brown stuff while you are pumping 12/18 gallons a minute into the already overflowing manhole and this can get messy up until the blockage clears, if in fact it does. These are powerful machines pumping away at 3000+ psi so if your jetting head finds its way out of the pipe and into the sub-soil it will dig itself into the ground given the right soil type, most experienced operators know when something is amiss when jetting however it happens to the best of us and most jetting hoses need replacing after a while due to wear and tear and having large sections cut off when the hose becomes stuck. Images and data care of draindomain.com.... visit the site for great information.